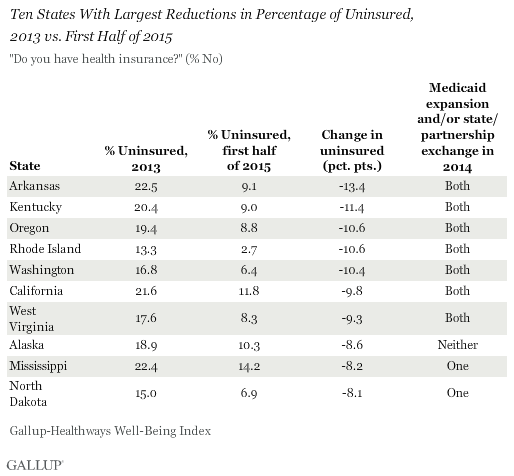 According to a Gallup poll released today, Washington is one of five states to exceed a 10 percent drop in the number of uninsured people. 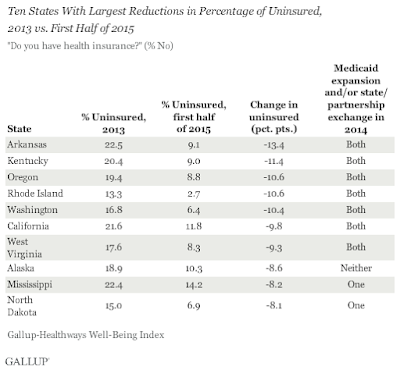 Seven of the 10 states with the biggest reductions have two things in common: they expanded Medicaid (called Apple Health in Washington) and established a state-based health exchange (ours is called Washington Healthplanfinder). Washington state has seen record-low rate requests from health insurers in the past two years. Insurers proposed an average 5.4 percent increase for 2016. These plans are now under review and the average rate increase is likely to be lower. For 2015 plans, insurers proposed an average rate increase of 8 percent. Insurance Commissioner Mike Kreidler eventually approved an average 1.5 percent rate increase. "I'm pleased to see the health insurers show an increased interest in the individual market and to see rates continue to come in relatively low,” Kreidler said when the 2016 rates were submitted in May of this year. Open enrollment for 2016 health plans begins on Nov. 1.